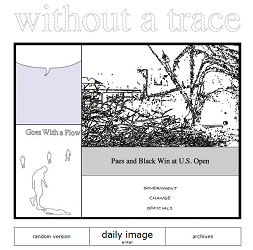 Without A Trace takes the idea of this daily ritual as its point of departure. Each day for a year, a comic image, a trace drawing, and three words from the original comic strip will be randomly selected from an archive. These will be juxtaposed with live text and image feeds from the New York Times online. This very personal practice of tracing from images in the print copy of the New York Times and the daily comic strip Real Life Adventures, lends the work a very personal and artisanal aura, as if we’re drawn into Zellen’s routine and artistic sensibilities. The subjectivity of the traced drawings is downplayed by the randomization of word choices from the online image feeds. In good comics form, Zellen juxtaposes the analog and digital worlds in this piece as she executes different processes on the materials to comment on the news and images of the day.